Steven Spielberg entered 2018 with two films ready to impress the audience worldwide: the Academy Award Nominee The Post and the pop-culture praise of 1980ies Ready Player One. Absolutely different, but both attention-drawers, the two films reaffirmed the director`s image as a multidimensional artist who can incarnate any idea of any genre on screen. For me Spielberg`s films were always divided into two groups: historically based realism, let`s call it ‘serious ones’, like Schindler’s List, Amistad, Munich, Bridge of Spies, The Post and the upcoming It`s What I Do. And entertaining ones and franchises, like Indiana Jones, Jurassic Park, Jaws, E.T. The Extra-Terrestrial, The Adventures of Tintin, The BFG, and now Ready Player One. There is also a borderline type of movies, like The Terminal or Catch Me If You Can, such a fables on screen. All in all, in his numerous ‘alter egos’ Spielberg appears as a master of breathtaking stories and their none the less breathtaking visual depicting. I don`t mean the visual effects actually, it`s all about his special vision and the skill of making every plot look amazing. His latest projects while belonging to the polar camps of his repertoire are both the great event for cinematic world. The Post screened earlier in 2017 was nominated for 90th Oscars Awards (Best Picture and Meryl Streep for Best Actress) but turned out to fall overboard. The film itself is a historically and dramatically sharpened masterpiece, a target shot in terms of cast, costume design and reflecting the atmosphere of early 1970ies, so what could go wrong on Spielberg`s way to Oscar? Maybe this year the trend towards noir fantasy stories (as The Shape Of Water that won Best Picture) has outshined the razor-blade political plots. Sure, The Shape Of Water storyline takes place not in some imaginary worlds but in strict and reserved realities of Cold War, but still it is far gone from history, while The Post is a kind of reconstruction of the real conflict between the media and the authorities in which the basis of the constitutional order and the American democracy itself were at stake. Worry gives a small thing a big shadow, so the Academy decided to take the path of least resistance, avoiding sharp edges of big politics. But how about Meryl Streep? Highly acclaimed actress, she lost the competition to Frances McDormand (Three Billboards Outside Ebbing, Missouri). The battle was tough: both actresses` performance was strikingly distinct and deserved an award, but the Academy made its choice in favor of McDormand. If one asked my opinion on this duel, I`d rather agree with the Academy due to the only reason: Frances McDormand has done a profound and vibrant job in Three Billboards. I don`t mean that Meryl Streep`s performance seem more pale or underworked, but she has somehow reprised her own image of an independent businesswoman with a nanosphere of self-doubt that she has once perfectly done in Devil Wears Prada. This fact does not affect her role in The Post anyhow, however gives an impression of an echo. Altough the film failed to gain Oscar, its cast unites all stars: Tom Hanks as editor in chief Ben Bradlee, surprisingly bold, energetic and sharp-elbowed, Bob Odenkirk of Fargo, Breaking Bad and Entourage as journalist and researcher Ben Bagdikian, Bruce Greenwood of Star Trek and The Place Beyond The Pines as former Secretary of Defense Robert McNamara. What a dream team! 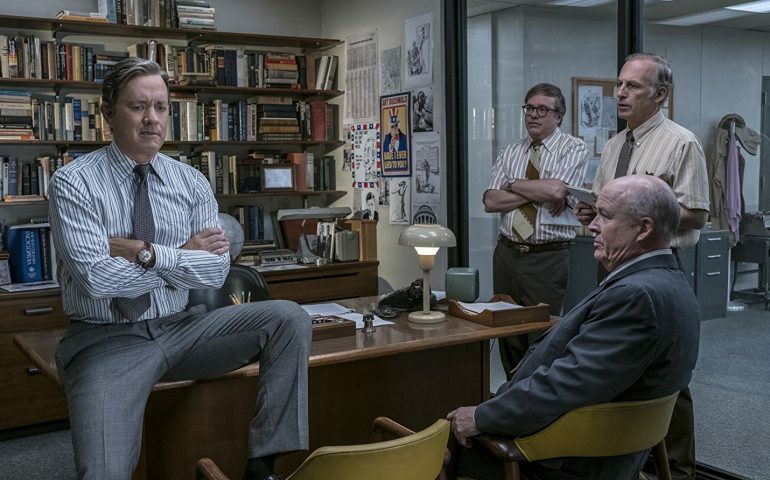 Despite the outcomes of the Academy arms race The Post will take its pedestal not only in Spielberg`s filmography, but in global highest movies ratings. New times, new sci-fi and adventures. Steven Spielberg has just presented his innovative project Ready Player One at SXSW Film Festival and at the grand opening in London. Nostalgic and modern, brand new and good old scented, this film was announced to be shown with RealD3D technology – the step beyond 3D. The onscreen novelization of bestseller by Ernest Cline, Ready Player One can be not just the technological sensation, but also a uniting clue for audience of different ages: teenagers will adore effects and characters that have their parallel avatars in virtual reality, adults will appreciate numerous links to 1980ies pop-culture, and everyone will enjoy the huge work done by high-ranking cast including Ben Mendelsohn, Mark Rylance, Simon Pegg, Tye Sheridan, Lena Waithe and Olivia Cooke. The film is also a benchmark in Spielberg`s cooperation with the top Hollywood studios: after 14 years of absence he returned to Warner Bros. with this project. And now the studio, the director and the writer discuss the possibility of launching a franchise, since Ernest Cline announced that he is considering composing Ready Player Two as a sequel long awaited by his fans. Ambitious plans cover other Spielberg`s franchises as well. Earlier in 2018 he confirmed the release date of Indiana Jones 5 that was set on July 9, 2020. He will continue The Adventures Of Tintin with the upcoming third part, and, going back to his historical dimension, he got inspired with the true story of a female photographer captured in Libya in 2011 (It`s What I Do, the main part went to Jennifer Lawrence).